Many people overlook the importance of fertilizing indoor plants. That's unfortunate because feeding is essential to keeping healthy, beautiful plants. 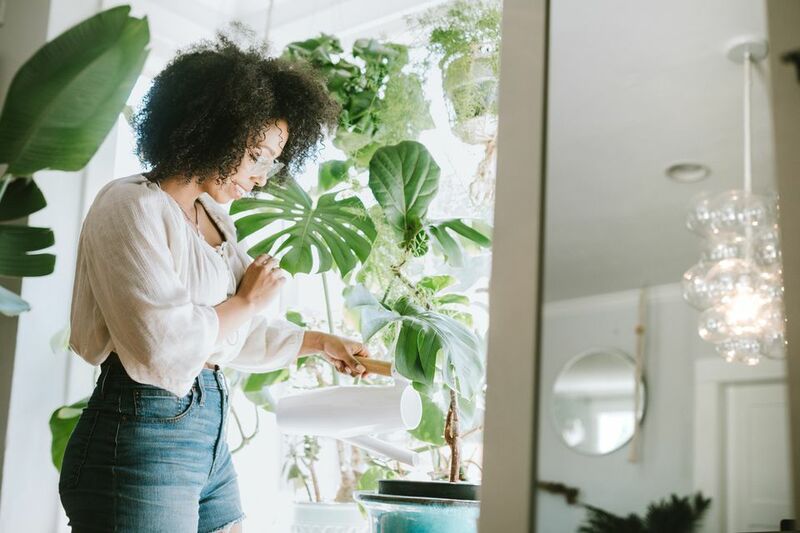 Unlike an outdoor garden, where nature provides rain and plants can send new roots searching for food, the nutrients available to a houseplant are strictly limited by the amount of soil in the pot and whatever else you give it as a supplement. Think of fertilizer as the second half of your potting soil. When your potting soil is fresh, your plants won't need much if any fertilizer. This is especially true of modern, fortified potting soils, which often have fertilizer and other enhancements mixed in. But after about two months, the plant will have consumed the nutrients in the soil, so you'll have to fertilize if you want continued, healthy growth. As a word of warning—always follow the label instructions on your fertilizer. Too much fertilizer can kill a plant or scorch its leaves, and there are environmental concerns when fertilizers are overused, as these nutrient-rich solutions find their way into groundwater supplies. Too much fertilizer is often worse than not enough, yet overfeeding is one of the most common mistakes made by well-meaning indoor gardeners. Fertilizers come in several different varieties: liquids, sticks and tablets, and granular and slow-release forms. Of these, the two best suited for indoor use are liquid and slow-release fertilizers. Sticks and pills seem convenient, but they don't distribute nutrients very well through the soil and, once you've inserted a fertilizer stick into your pot, you have no control over its release. Granular fertilizers are really designed for outdoor use. Liquid fertilizer. Liquid fertilizers are added to your watering can. Depending on label instructions, you might fertilize every time you water, or every other time. The type of plant will also impact this, as some (especially those with dramatic large blooms) may require more frequent feeding. Always study up on the plants themselves to learn what their nutritional needs are. There are literally dozens of liquid fertilizers on the market. The advantage to liquid fertilizer is that it provides a steady supply of nutrients that you can precisely control. It's easy to suspend feeding when the plant is dormant during the winter months, for example, or step up the feeding when they are sending up new growth. The disadvantage is that you need to remember to do it every time. Granular fertilizer. These are dry pellets of pure fertilizer that can be mixed into the potting soil by hand. Although more commonly used in outdoor gardens, they can also be used for containers, although it can be tricky. They will dump all their nutrients at once when the pot is watered, making it hard to control how much the plants are receiving at once. They are quite inexpensive, but granular fertilizers are not a great choice for feeding houseplants. Slow-release fertilizers. These products have quickly become favorites for many gardeners and professional growers, both indoors and out. Slow-release fertilizers, like Dynamite and Osmocote, are coated in time-release shells that slowly leach nutrients into the soil. The individual pellets have coatings of different thicknesses that dissolve at different rates, so the actual release of the fertilizer is staggered over time. A single application of Dynamite can feed your plants for up to nine months, while Osmocote lasts about four months. Their main drawback is their price, but because they last so long, it evens out in the end. Nitrogen encourages healthy foliage growth. Potash encourages bigger, healthier blooms. Specialty fertilizers, such as African violet fertilizers, contain optimized proportions of these nutrients for particular kinds of plants. In addition to these macronutrients, better quality fertilizers also contain micronutrients such as boron, magnesium, and manganese that will encourage healthier growth. Study the fertilizer label to determine what it contains.